A friend of mine asked if I could post some photos of some projects I did in the past. 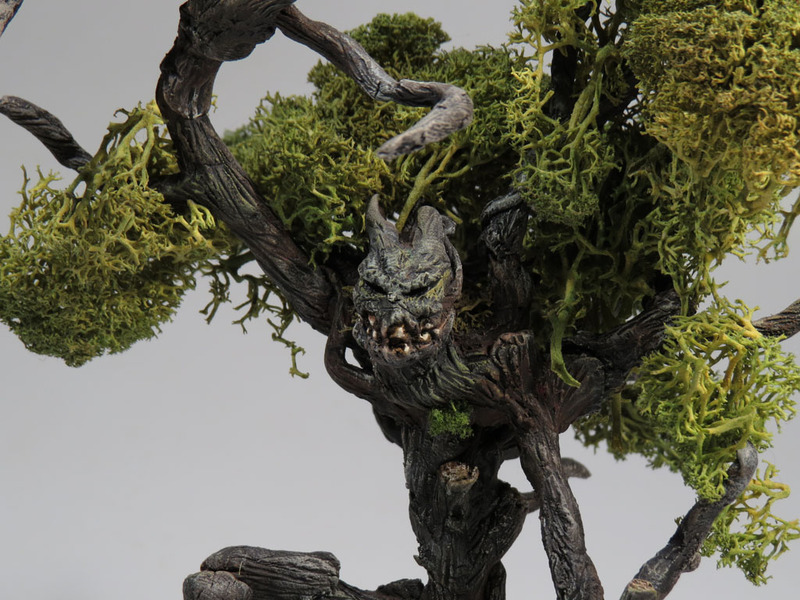 Here are 3 ‘mini’ sculpts I created a few years ago: An evil tree-man, a huge earth elemental and a giant owl-bear from the D&D universe. 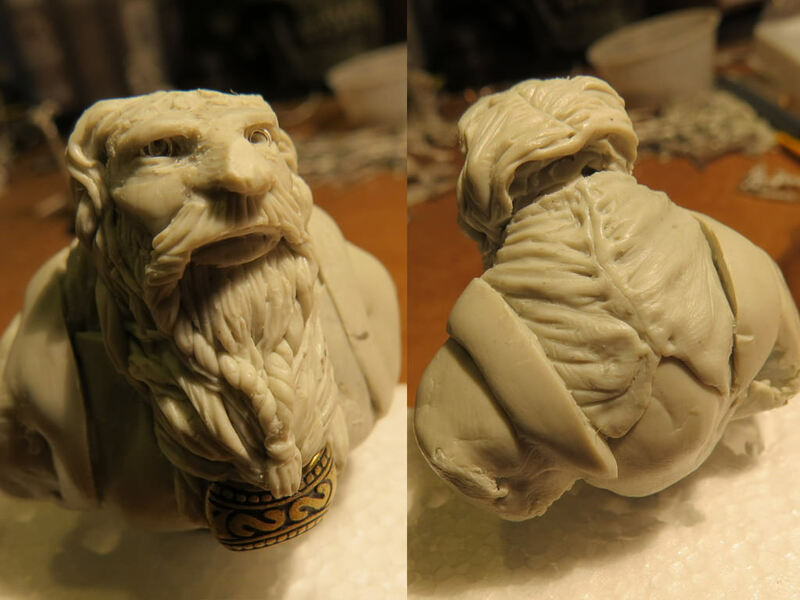 All these were sculpted mainly using Magic Sculpt putty. I did a conversion on my Barbarian Hero miniature from Reaper. 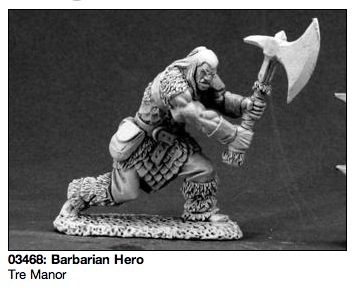 Barbarian Hero, a very nice 28mm mini by Reaper Miniatures. I wanted a barbarian with a 2 handed sword instead of the axe this big guy is wielding. I also wanted to make a nice, small (1 inch) base for it. 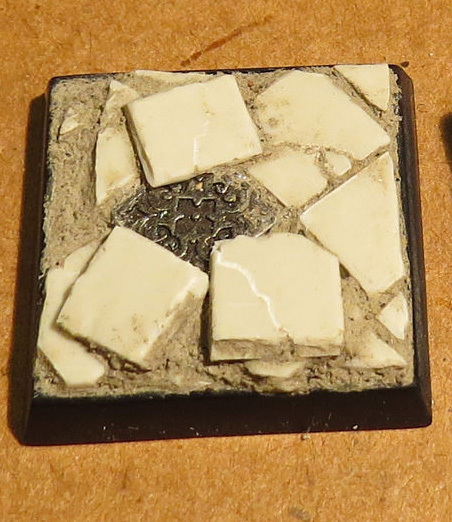 The base “provided” with that mini (actually, the mini is molded with a thick wide base) was too wide, so I had to cut it partially to make it shorter, so it could fit on a standard 1 inch square base. I change the “stance” of the barbarian by raising a bit his left foot, so he’s more upright (almost like “climbing”). 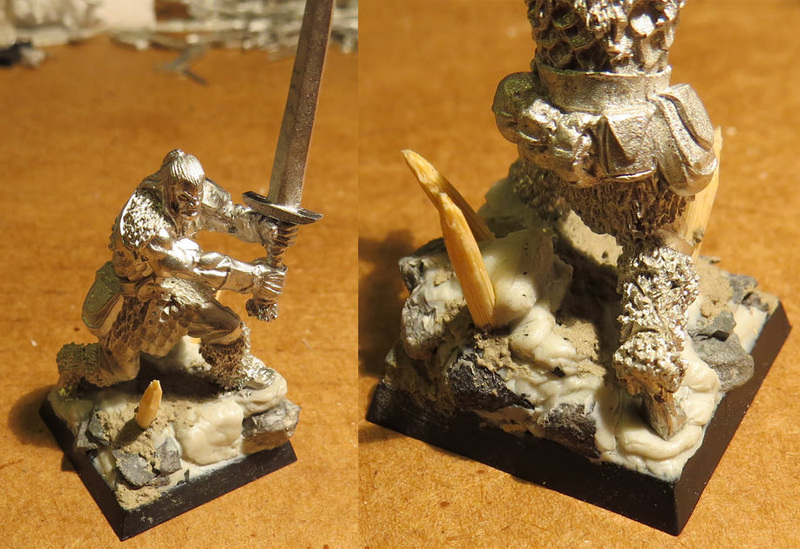 Barbarian Hero, with custom base and sword. As for the base, nothing special here: standard techniques with small rocks, Magic sculpt, a bit of mortar and toothpicks. I plan to make a winter theme base for this one, with some snow. That will be a first for me: I never made snow on a mini base. I’ll post some pictures when this little project will progress. A simple base to make, really. With techniques I use often. I just got my Raynox DCR-250 lens and did some tests. 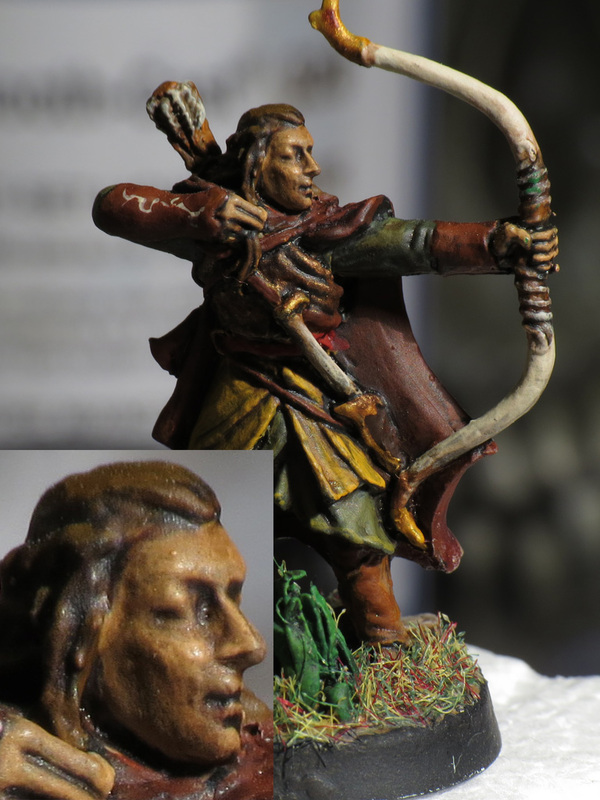 Elf archer, 28mm. Shot taken with a SX-50 HS camera equipped with a Raynox DCR-250 macro lens. 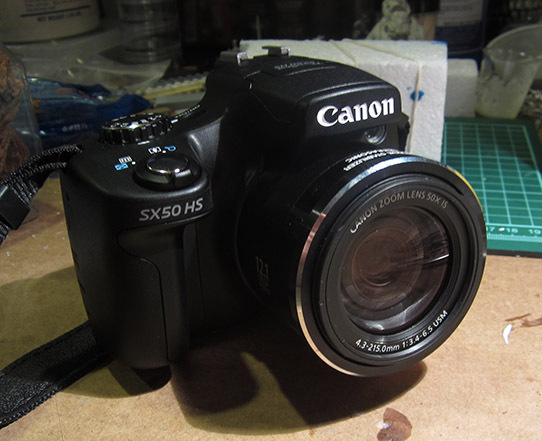 I recently purchased a new camera: a Canon SX-50 HS. I wanted to have an alternative to the Canon ELPH-100 HS (my daughter’s camera) wich I was constantly borrowing and using, mostly, for macro photography. The ELPH-100 is a very good little camera, 12 megapixels, compact and easy to use and it takes good pictures. It is small enough to fit in your pocket and shines when you want to take outdoors photos of people and landscape. But inside, under tungsten lights and in extreme close-ups, it has limited capacities and I was constantly shooting multiple time each subject, struggling to get the focus ok and no matter what setting I used, the colors were always washed out, so I had to post-process the photos in Photoshop to color-correct them. Don’t get me wrong: the ELPH is a very good camera. The point is I needed more, but I am not a very good photographer so the camera needs to do a bit of work for me and be somewhat easy to use. So, I needed a “bridge”: a camera that is in that category between professional cameras and casual cameras. Enters the SX 50 HS (12 megapixels too). 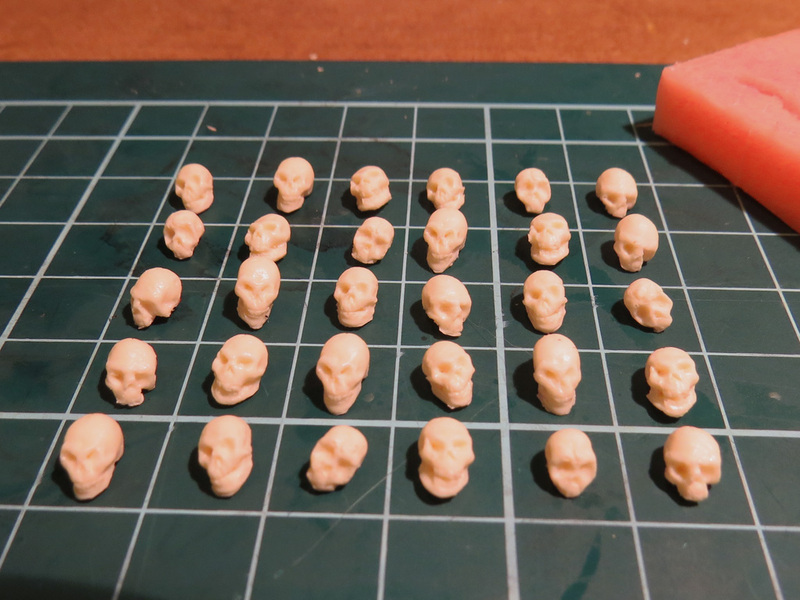 Here is the result of the molding and casting of my tiny skulls. The Army of the Dead!